After being faced with the decision on buying a new lawn mower, I decided to take a trip to Home Depot and decide which lawn mower would be best for me. Some things to consider when buying a lawn mower are; size, price and most importantly durability. After a few minutes I knew which one caught my eye. With the most reputable name in the line-up, how could I go wrong with Honda? They build reputable cars so I knew that must make durable lawn mowers as well. I selected a Honda, HRX217K2VKA. This model with its red and black color just seemed to peer out from the rest of the mowers. The price was within my budget and with Home Depot’s 0% financing I couldn’t go wrong. I brought the mower home and the first thing I did was go to work on my lawn. I filled the mower up and started it right up. The first thing I had to notice was the lawn mower absolutely moved by itself. This was wonderful; I didn’t really have to even push it. I engaged the blade and pushed it for about 15 feet when I noticed, it seemed to cut at perfect, even height. This mower was perfect. Overall, I’ve had this mower for 3 months and not a single complaint yet. One extraordinary point is that the mower uses a lot less gas than most mowers I’ve used and the maintenance on it has been nearly nothing. A great mower with a reputable name and warranty behind it! I recommend it to anyone. John Deere JS46 can't touch this Beauti!! I bought the John Deere J46. A very power machine but the mulching was horrible. Grass fly everywhere and the mower is dirty with grass clipping. Somehow the front left side of the wheel came out of it position and I was cutting at an angle and the blade hit a tree stump that I did not have a problem going over before. I broke the shat and Lowe think that it might not be under warranty because of the broken shaft. I won't get an answer for another 2 weeks. I like in a TN with very strick home associate and grass has to be cut 2 times a week or the grass will get wild. Read a bunch of good reviews on this model. Bought it from Home Depot. I was already impress with easy folding handle compare to the time consumming John Deere version. Got home, put the oil, fill the tank, and smooth start up. Much quieter and did feel the power compared to Deere. WOW, it cut, grass disappeared. Gave a thumb up to my wife. Tall grass was cut with ease, if it weren't for the rain that came out of no were, I did not get to finish the front. BEAUTFUL MACHINE. After cutting my big back yard, mower was still looking clean. Spend the money and give it a try. YOU WILL LOVE IT. I own a Honda HRX217K2VKA lawn mower. I have owned it for some time now, and all I really have to say about it is that it is one of the best push style lawn mowers I have ever used. It is also one of the simplest lawn mowers I have ever used. Even though it is a push style lawn mower it is also self propelled with the simple action of pulling down on a bar located at the top of the lawn mower which controls the transmission. The Honda starts up very easily every time I start it, unlike some of the other push style lawn mowers I have owned over the years, where it seems like no matter how hard you yank the pull start and mess with the choke, it just won't start up. The Honda is also a Honda, meaning the 190cc engine in this lawn mower is going to last you a lifetime as long as you take care of it. The lawn mower blades are very strong and sharp and I have never had a difficult time cutting even the thickest patches of grass, weeds, and small plants. The bag is easy to remove and the mulch comes out without much effort. This is a nice push style lawn mower, and it should last me a lifetime as I take very good care of it. In the event that something does go wrong with it, the Honda HRX comes with a lifetime warranty so that I won't have to pay for the repairs out of my own pocket. I also own a ride on lawn mower which is very useful for large areas of grass, which I have on my property. When it comes to getting the smaller patches of grass or getting the corners of the yard, the Honda is a much better choice because it is smaller and can reach the corners of the yard without running into the fence like my ride on lawn mower. All in all the I am very pleased with the Honda HRX series and would recommend it to anyone. Join in and write your own page! It's easy to do. How? 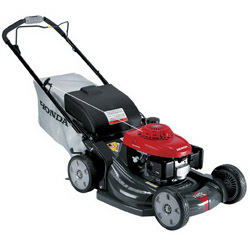 Simply click here to return to Honda Mower Consumer Reviews.